Metal lawn edging finishes landscaping cleanly and keeps grass where it belongs--out of your flower beds. Metal edging is an investment, lasting 20 to 30 years. It costs more than railroad ties or treated wood edging, but is much less expensive than rock and stone. Choose aluminum edging over steel for ease of installation. Most residential edging is 12 or 14 gauge, although you can purchase heavier, professional grade edging from a landscaping business. Look for edging with a rubber edge to protect bare feet. Lay a garden hose along the flower bed edge to determine the desired border of your bed, or use boards to outline a straight-edged border. Sprinkle powdered chalk on the grass, following the hose or board to create an outline of your flower bed border. Remove the hose or board. You'll see the chalk remaining on the grass, providing a clear template for your edging. Dig a thin (1/2 inch wide) trench 6 inches deep with your spade, following the chalk outline. Measure the trench every 12 inches to make sure you've made the trench uniformly deep. Place the metal edging in the trench with the stake pockets facing the bed. Bend the edging with your hands if necessary to accommodate curves in the border. Be careful, as metal edging is easily dented or damaged. The edging should sit 1/2 inch above the ground. Overlap edging pieces by 2 inches. Move the stakes into the stake pockets. Tamp them securely into place with a hammer. Cut edging left at the end of the border with a hacksaw. Score the face of the edging slightly to create a cutting line. Cut 1 inch into the edging on that line. Bend the edging, using a back and forth motion, until it breaks. Backfill the space around the edging with soil to seal the trench. Walk on the soil to press it down firmly, adding more dirt if you notice pockets. Water your lawn and inspect the edging. If gaps remain, fill with more dirt and press down again. 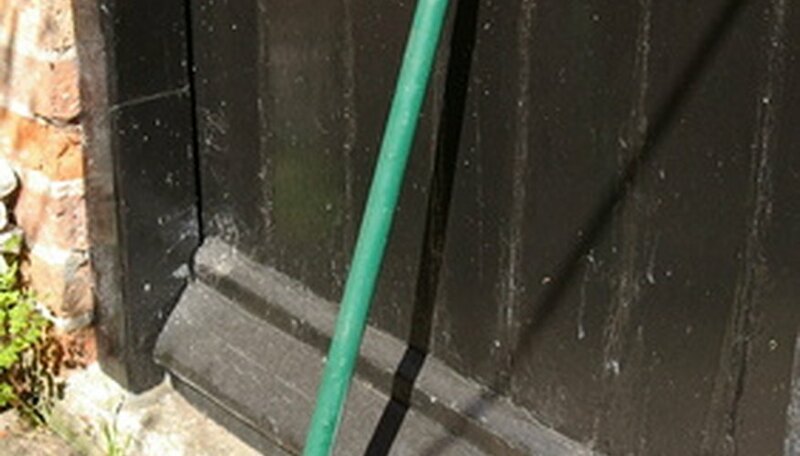 Stay safe by wearing goggles and work gloves when installing metal edging. Sharpshooter spades are extra long, making easy work of digging deep trenches. Put removed dirt on a tarp or in a wheelbarrow to make removal easier. Place the wheel of your lawnmower on the edging to mow the lawn flush with your border. How Do I Make a Poor Man's Concrete Driveway?